Dining Chairs from Westminster Teak Dining Furniture. Folding Chairs, Fixed Chairs and Stacking Chairs. 100% Grade A Teak Wood. Extremely Durable, High End Construction and finely sanded to an irresistibly smooth finish. All of our chairs are precision engineered to last over 75 years, outdoors and untreated. All of our wood chairs are suitable for indoor, outdoor, residential, commercial and marine use. 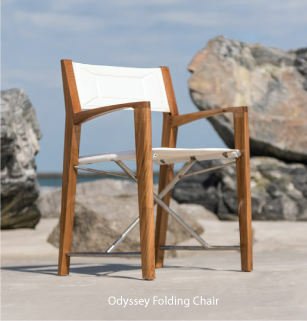 We received the Teak Wave Dining Chairs Tuesday. Ordering teak chairs over internet is a risk to take. However, the teak chairs are very comfortable and they also look great. I purchased a teak dining table and Grand Hyatt teak armchair set from you this spring and am very happy with it! We recently stayed at the Kapalua Bay hotel in Maui and saw the same teak chairs in their lanai dining room! The teak furniture made it fine. Looks good!!! I would like to place another order. I knew I would want more teak chairs if I liked the one I ordered, so I would like to order 3 more. You have a good product here, and I think your customer service people were great. Thanks so much for the prompt delivery of my order. The teak chairs are fantastic and your service is second to none. The teak garden furniture arrived in excellent condition and on schedule. I was very pleased with the quality of teak wood and brass fittings. The teak chair is lovely. I would not have any problem recommending you and your Internet site. I did indeed receive all the teak outdoor furniture in a very timely fashion, and all the teak chairs were not only intact, but as nice a depicted on the web site. I am very pleased with the teak chairs. They look very nice. Many thanks!